At a hearing in April, the developers sought variances for height, 35 feet more than the underlying zoning allows, and commercial space. It was supported by local civic groups and Councilwoman Blackwell’s office, but opposed vociferously by two neighborhood residents who live a few blocks from the property. Mary McGettigan and Larry Caputo, the opponents of the project, noted that the project didn’t conform to either the existing or proposed zoning of the property. They argued that the developers hadn’t made their case that the zoning designation represented a hardship on the property. The ZBA voted to support this project. But it only did so by a 3-2 margin. This, despite the fact that the developers had gone above and beyond in incorporating the community voice in their design. It's fairly clear that -- had there been no dissenters who showed up at the meeting -- the project would have sailed through the ZBA. That's all it took to nearly derail a small apartment building that is in scale with a number of similar buildings scattered throughout the neighborhood. As if you needed any more evidence modern zoning is excessively restrictive! These concrete tree thingies that seem to be generally Brutalist have proven to be aesthetically successful over time. A combination of simple geometric features emphasizing the use of (reinforced) concrete and glass, a simple cantilevering, and a layout that manages to evoke traditional columnular layouts while at the same time offering characteristically Modernist light airy spareness. The example shown above is the Katowice train station, demonstrating how this style is particularly effective for structures whose principal organizing element is a large, open main hall. How this exceptionally American land-use system came into being during the late 1800s and through to the 1930s is the primary focus of Hirt's book. In chronicling this period, many apparent paradoxes present themselves: for instance, although the United States of the late 19th century prided itself on being the most democratic nation in the world, its citizens had a low level of trust in their elected municipal officials. The progressive municipal reformers of the time might therefore have campaigned for planning to be guided by state or federal governments, but instead pushed for non-discretionary municipal-level zoning. As Hirt observes, zoning reformers such as Lawrence Veiller argued that "zoning rules should vary as little as possible in districts that were as large as possible and that zoning relief should be granted only under a very limited set of circumstances, if at all." But if the planning powers were delegated from state to city, and the city was to have little power to alter the apparently infallible choices of the initial zoning commissions, who was left to actually engage in city planning? No one, as it turns out. Planning commissioners were seemingly intended to be little more than curators of the city zoning map, and Hirt finds, as I have also noted, that zoning maps have changed relatively little in their basic allocation of space since the 1920s. As I've written about before, the actual policy that zoning was intended to serve was almost an afterthought, and was primarily concerned with protecting the investments of wealthy homeowners. By default, and perhaps unintentionally, city planning (to the extent it existed at all) was turned over to the emerging highway engineering profession. American zoning policy, in sum, was a negative and reactive vision -- through its implementation, it viewed cities as incapable of honest and effective self-government, and by its actual regulations, it viewed urbanization as a threat to not only investments but to civic spirit and even the American way of life itself. As Hirt writes, "[t]he single-family home had the right to the city: it was always seen as being there first. It was the gracious host, the delicate victim, and the original citizen that was always haunted, followed, invaded, and taken advantage of by other housing types." In this sense, Hirt's book echoes the conclusions of Steven Conn's recent Americans Against the City: Anti-Urbanism in the Twentieth Century. The key takeaway of this is fairly simple: American zoning was already being used as a tool to prevent redevelopment as early as the 1920s. Zoning theory, while it grew out of nuisance law and European (especially German) practice, was already being adapted to exclude rather than include -- zoning, by design, is a hyperlocally-devolved tool. Indeed, the basic idea seems to have been to zone land such that intensification of existing development was made impossible, a practice which inevitably would concentrate redevelopment in the most intensively-used areas -- and on the greenbelt edges. And because there was no systemic planning practice designed to rezone, it has been left to politicians' whims, which often result in downzonings once communities realize that existing zones allow more intensive land use than what currently exists, and state DOTs -- whose highway extensions (and not mass transit extensions) have been, since midcentury, what has opened new land up to development. What is curious to note, then, is that American sprawl is driven by what is essentially a units problem. In the hard sciences, units problems rise when units are misapplied, or when they're inadvertently mixed. For example, while a velocity calculation might be mathematically simple under constant acceleration, the result has to be in the same units as the inputs (e.g. m/s, cm/s, mi/h, etc.). Mix up the units -- say, by measuring an object's weight when what you want is its mass -- and you throw your calculations off. Similarly, inappropriate aggregation can often hide more than it illuminates: this is one of Jane Jacobs' key critiques of mainstream macroeconomics, that the sovereign nation is fundamentally an inappropriate unit for economic measurements, as it almost always represents an aggregation of very much economically disparate regions. By over-empowering land use planning at the hyperlocal scale, we inadvertently disempower reasonable land-use planning at the scale where it matters most, as far as optimizing spatial efficiency relative to amenitization is concerned: the greater conurbation. Static land use paradigms undercut the efficacy of mass transit (as has often been pointed out at Urban Kchose); because zoning law is not designed with spatial efficiency in mind -- and, indeed, almost every solution to any given land-use problem increases spatial inefficiency -- we find ourselves unable to respond save by sprawling more ... and more ... and more. Sometimes small-scale intensification is not aesthetically pleasing: witness D.C.'s pop-up house, which, now that one has been built, has been banned. Indeed, this has generally been zoning's modus operandi -- regulate nonconformity into nonexistence. The problem with this is, however, that at a certain level, small-scale intensification requires aesthetic flexibility. Indeed, this may be old urbanists' strongest criticism of New Urbanism: that it overfocuses on form, while underfocusing on the land-use development process -- the true locus of the sprawl process. This is perhaps where Strong Towns has come into play: it has gained traction and has been growing, as a grassroots movement, precisely because it has correctly identified the core problem: a broken process: a process that enshrines a static, rather than dynamic, vision of the city. But here is an interesting issue, and once where there might actually be natural friction between Strong Towns and old urbanists: short of total curtailment of land use regulation (an extremely libertarian solution), while the issues in transportation engineering are clearly defined by its excessively top-down paradigm, the problems with spatial planning are caused by it being excessively bottom-up. That is, resistance to change is driven not by new inhabitants but by the ones who already live there, and have the time and energy to mount opposition (which, due to the way the playing field is skewed, is almost always effective opposition). Even very simple changes -- for example, liquidation of excessive parking regulation, making small multiunit structures legal, moderate height increases, and other examples of incremental redevelopment -- are opposed so fiercely that, outside of large urban cores where an effective development counterpresence can be built, they are unlikely to get any traction. The long and the short of this can be summed up by saying: The current land-use planning paradigm is fundamentally broken. Moreso, it is fundamentally broken because current American regulation creates a static vision of the city, rather than a dynamic one; this fundamentally empowers interests that favor their static vision (NIMBYs) while disempowering ones whose vision is dynamic (developers). And, despite many planners' attempts to make dynamic redevelopment easier, the truth is that the discipline's entire toolkit, over-oriented towards a static vision, greatly inhibits what can be done, and yields marginal results of even the most sweeping efforts. So I stumbled across this post the other day. In it, the poster argues that, while the northern half of Jersey City's Newport district seems to have made an attempt at Vancouver-style urbanism, it does not succeed to the degree Vancouver's does. Newport, Jersey City. It's telling this -- not a streetscape -- is the beauty shot. This is not an unfair claim. Having been in Newport a couple of weeks ago (because Reasons), I can confirm with my own eyes that, while the River Drive is a reasonable urbanism, and the corner of Washington Boulevard and Town Square place has -- even when it decides to rain -- more than enough people to overcome its inferior site design, the southeast corner of Newport is a weird corner of buildings spaced too far apart: a sense of enclosure is lacking, and the buildings don't really capture as much commercial energy as they ought to (despite the existence of excellent sushi and boba tea joints). In large part, this is because Newport's first phase dates to the late '80s: up to about 1960, the site was home to the Erie Railroad's Pavonia Terminal, a handsome Victorian edifice. 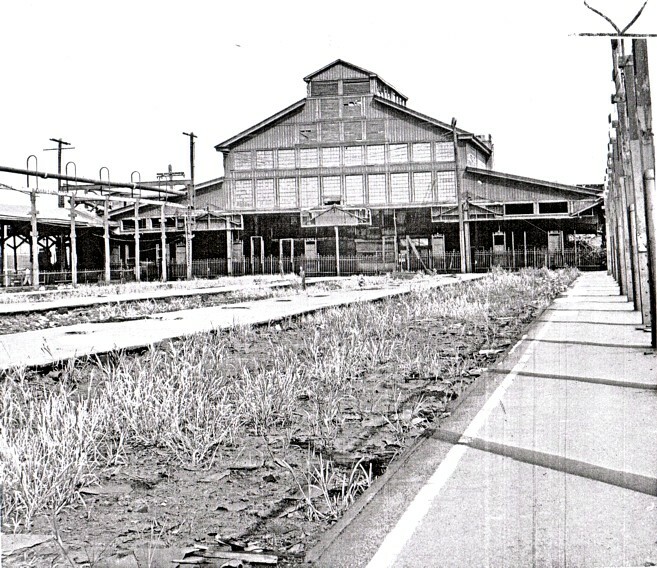 Photos from the '70s show the passenger terminal as having fallen into ruin (though it is unclear whether the Erie's successor, the Erie-Lackawanna, had freight facilities in the area). By the early '80s, the bankrupt E-L was absorbed into Conrail, along with a whole bunch of other railroads; it focused its freight landport at the old Lehigh Valley (another bankrupt railroad)'s Oak Island Yard in Newark's Ironbound. * The complete abandonment of the E-L's waterfront facilities soon followed. The Urban Prospector shows a Sketchup mockup of both the southern and northern parts of Newport, focusing on the long streetscape gaps to the south. Those gaps are the ultimate end-result of the planning of the day, which favored generous "open space": the Modernist tower-in-a-park paradigm. While towers-in-parks and commercial aren't necessarily antithetical to each other, it is notable that in examples where commercial has successfully been integrated into towers-in-parks, such as Metropolitan Ave. in Parkchester, the Bronx,^ it is built to the street, taking over the green space. That's because the eye is caught by proximate activity. When this activity is not well displayed, or is broken up by excessive greenswards (which also serve to decant park use, thereby making each greensward less interesting) -- both of which are the case in south Newport -- the street becomes significantly less pleasant. The more green "open space" a site has, the worse it's framed, the less concentrated its use, the less urban the neighborhood. Despite the river walk -- a key amenity -- this is clearly seen in south Newport. Fortunately, it's easy to calculate open space -- it's how much of the site isn't, in fact, built on. That is, it's the opposite of a site's building coverage. For this exercise, I decided to consider "North Newport" the developed part of River Drive north of Newport Parkway. (The southwest corner of Newport Drive and 14th Street is clearly a parcel that hasn't been developed yet, not a public or semipublic green space; the same holds true for the piers.) South Newport is considered the part of Newport that extends from Newport Parkway down to Thomas Gangemi Drive east of Washington Boulevard. I was also interested in how much of the open space is given over to car use (storage, mostly). Finally, I disregarded the street, considering it public right-of-way. Here is the map yielding the polygons I used. This means that there are a total of 5.29 developed acres in North Newport, of which a mere 27.6% is "open space", arranged as part of the riverside park and a small plaza. Summing this up, we see that there are 26.28 total acres in south Newport, of which 13.8 acres are "open space", some 52.5% of the site. A surprisingly low 33.7% of the "open space" is actually devoted to cars: its high visibility has urban fabric-destroying impact, however. But what about the undeveloped parcels? There are three undeveloped sites around Newport Green Park, totaling 13.06 acres. Assuming they are developed to the same density as north Newport^^, that yields 3.60 acres of open space, or 9.6 acres covered by buildings^^^. If we consider "greater north Newport" to be the sum of developed north Newport + undeveloped north Newport + Newport Green Park (4.93 ac), that yields 24.02 acres. According to our methodology, 9.99 acres of that will be open, or 49.6% of the site. This compares favorably with south Newport's 52.5%. Can this be replicated elsewhere in Newport? Yet because of choices in how the "open space" is placed, north Newport's 49.6% will be far more effective, and far more heavily used, than south Newport's 52.5%. 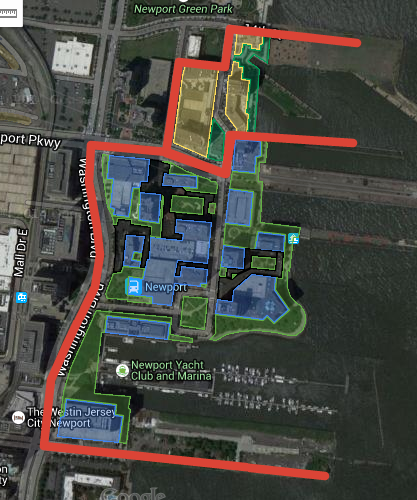 That's because north Newport's open space won't be decanted into small enclosure-destroying plazas and port-cocheres the way south Newport's were. 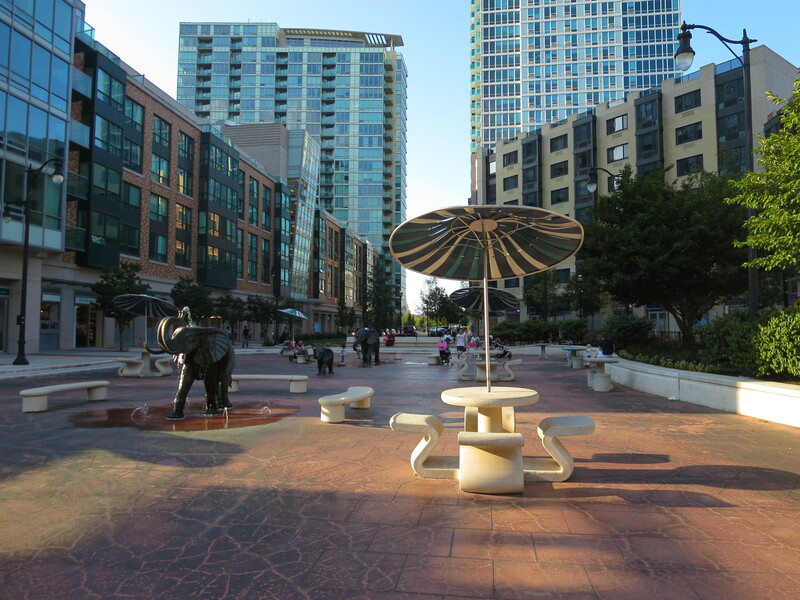 Instead, it'll be concentrated into one well-sized neighborhood park, a place that's already well-loved, despite the fact that but a single development abuts it. * It is notable that the Erie-Lackawanna's other predecessor railroad, the Delaware, Lackawanna & Western, had built what was perhaps the best non-Pennsylvania Railroad freight route from New York west. But when I-80 was built through Paterson, the State bought part of the E-L's low-grade mainline; freight movements on the replacement route, a commuter branch now part of the New Jersey Transit's Montclair-Boonton Line, proved less than ideal (and is, in fact, cited as a contributing factor as to why the E-L failed to outcompete its collapsing competition). Had the E-L retained the track connection through Paterson, it is likely that Conrail would have favored that -- shorter -- mainline to Buffalo, which in its turn would have favored more intensive passenger use of the Water Level Route -- today's Empire Corridor. ** Which should have been preserved and renovated IMO. *** Or possibly just the success of Battery Park City (built by the same developer). Though, that said, Battery Park City has perhaps the blandest streetscape of any Manhattan neighborhood. ^ Incidentally, fully planned as early as 1939, which helps explain the unusual insertion of a Main Street when similar postwar projects (cf. Lafayette Park, Co-op City) favored small strip malls. ^^ Which may or may not be likely. ^^^ But what about streets? There has to be automobile access, especially on the huge northernmost parcel! According to the Business Journal, American Water is getting a $164 million tax break to move to Camden. • Volunteers of America Delaware Valley(VOADV) was approved for $6.3 millionto consolidate administrative offices into one facility in Camden rather than a location in Bensalem, Pa.
• Subaru of America netted $118 million in tax breaks to move its U.S. headquarters from Cherry Hill to Camden. • Cooper Health System received $40 million to move about 350 administrative jobs now located in Cherry Hill and Mount Laurel back to its main campus in Camden. • The Philadelphia 76ers obtained $82 million in tax breaks to build a practice facility and corporate headquarters. • Holtec International received $260 million in tax breaks to build a manufacturing facility. • Lockheed Martin was provided with $107 million in assistance to relocate employees from Moorestown to Camden. All told, this is about $777.3 million, more than three-quarters of a billion dollars to get companies to locate in Camden. If American Water leaves its Voorhees, N.J. headquarters for Pennsylvania, then New Jersey will lose about 600 jobs on top of hundreds of potential new jobs that would go into constructing American Water's new campus. If American Water was to move their corporate HQ to Pennsylvania, would they move it to Moon Township? Of course not: that would involve uprooting ensconced executives. It would stay in the Philadelphia area (winding up, most likely, in Bensalem). The economic impact of this strategy is nil. There is no net change in regional economic productivity. There are no new jobs, no new work. All this does is marginally change commuting patterns. And while it's nice that the new Camden jobs would be close to PATCO, is this marginal access improvement really worth $777.3 million in public money? Instead of subsidizing existing jobs, wouldn't that $777.3 million be better spent elsewhere? If the goal really were to make more jobs instead of simply bribing companies to go where you want them to, wouldn't a far more effective program be a small business incubator in Camden?